For nearly two years now, I have been telling pretty much anyone who will listen to me that my blog, The Norman Nation, is a joy-spreading international phenomenon that is slowly taking over the world. It turns out…I’m right. Recently on Blogspot.com, which houses The Norman Nation, I discovered a tab called “Stats." This feature revealed some pretty startling information. For example, to date, The Norman Nation has been visited 7,137 times. Even if you subtract the 500 or so times I’ve obsessively-compulsively stalked my own site to see if anyone has made comments, that’s an impressive number. As we dig deeper into the numbers, my mind continues to be blown. 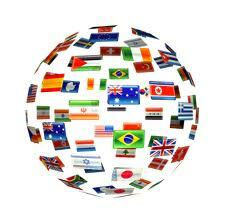 The site has been visited 514 times from the United Kingdom. Granted, I did live in London when I launched The Norman Nation and I do some stand-in modeling for David Beckham, so that’s not terribly surprising. But what about Canada? I’ve never lived there. In fact, due to a misunderstanding several years ago involving an elk, Wayne Gretzky, and some Canadian Mounties, I’m not even allowed in the country. Still, the site has been hit 514 times from our neighbors to the north. Now, I know what you’re thinking. “Canada and the UK? Big woop. Aren’t those basically the 51st and 52nd states, just with crappier TV?” OK, fair point. But the site has been hit 113 times from the Netherlands. The Netherlands! I’m not even sure that’s a real place. And how about 105 times from South Korea? 57 times from Latvia. What? Latvia? Are you kidding me? Isn’t that the moon-planet where Chewbacca was born? That’s not all. 54 times from Australia. And 51 times from Russia. That’s the Soviet Union, right? Yeah, I may have single-handedly ended the Cold War. Are you reading this blog right now from some crazy-assed, possibly-pretend country that’s not the United States? If so, drop us a comment, and feel free to use whatever weird foreign language you speak there.